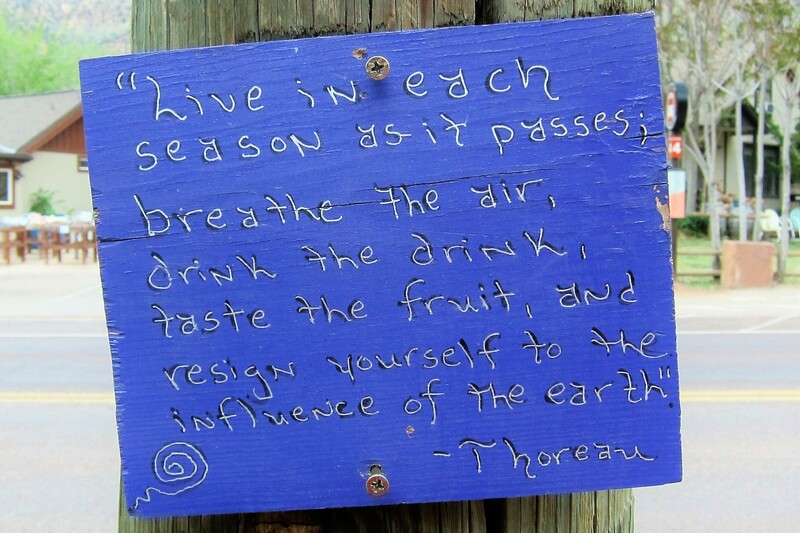 Thursday, April 7 and Friday, April 8, 2016-Zion National Park: The above homemade plaque featuring a Henry David Thoreau quote was spotted in the gateway town of Springdale, Utah. It is a departure from our usual quote style but I liked the message and the spontaneous method in which it was displayed. 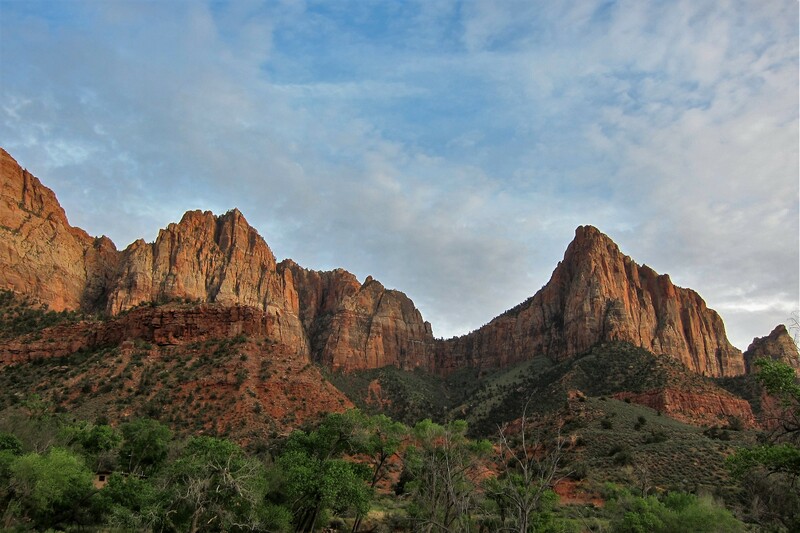 Kit and I each have our list of favorite places to experience and Zion National Park in Southwestern Utah is near the top of those list. 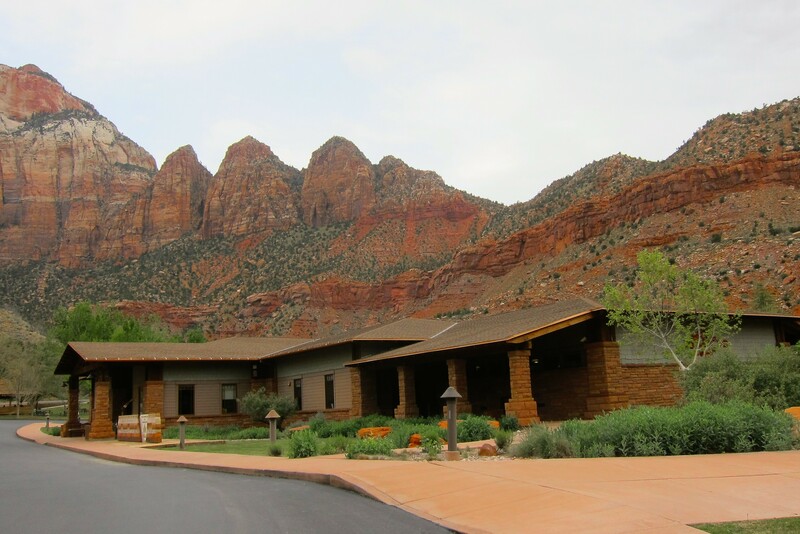 Springdale, the little town that borders Zion, is a favorite as well…with a year round population of 500 folks, the town started life in 1862 as a Mormon farming community. Today its main occupation is catering to the thousands of tourist that flock to the area each year. 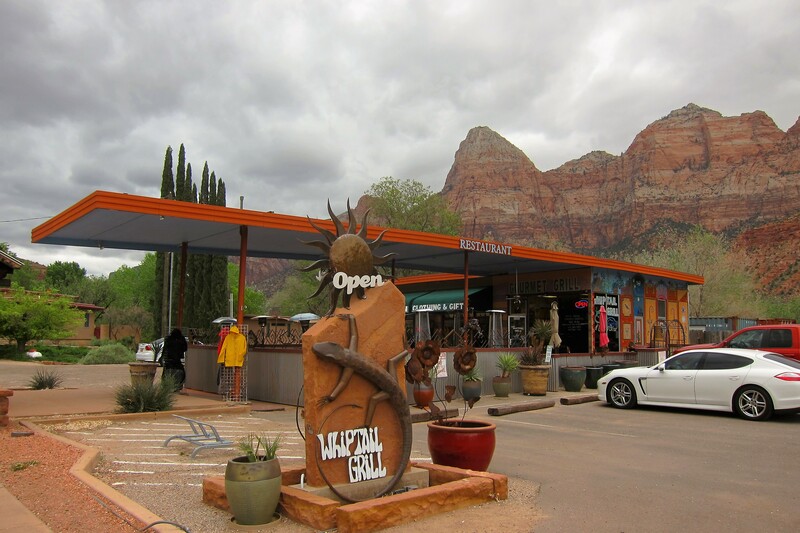 Shortly after arriving at Zion, Kit and I took the park shuttle into Springdale to mosey around a bit. We walked the main drag, browsed in some of the shops, and visited the newly constructed library. Kit really loves spending time at libraries, and I needed to use the computers and printers to print out my Tax Deadline Extension so it was a mutually beneficial stop. After some additional meandering about town, it was getting time for lunch so we decided to check out a place that had been recommended to us…The Whiptail Grill. 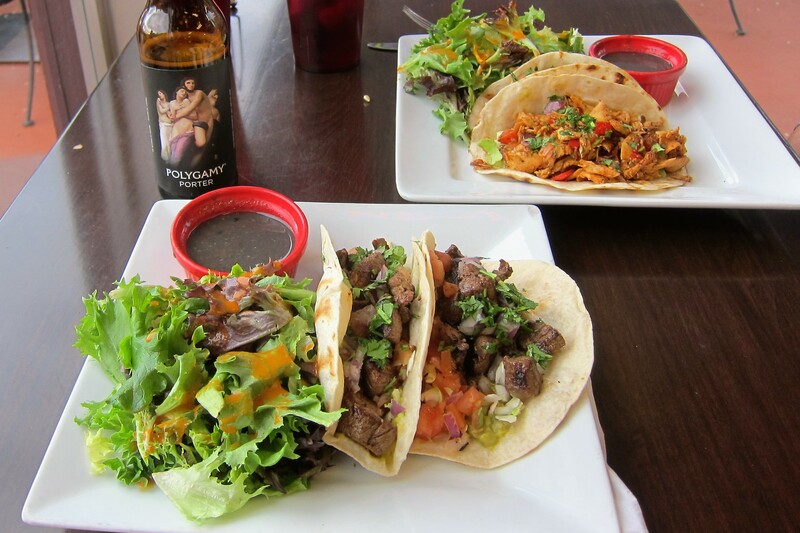 We each enjoyed Tacos…Carne Asada for me and Chicken for Kit. Both were excellent, and as you may have noticed, I indulged in a Polygamy Porter as well! Not only is it a great tasting local brew, but I like the funny slogan: “Take Some Home to Your Wives”! 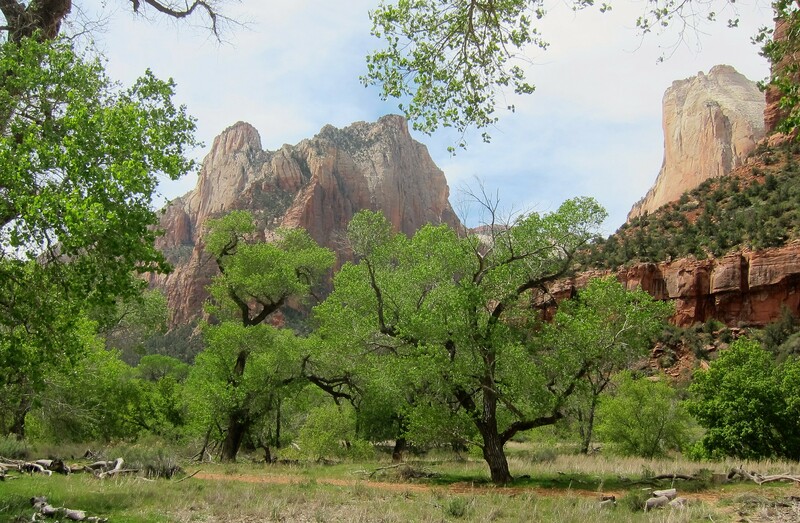 You may have noticed in the background of our photos, this whole area has an abundance of dramatic and stunning landscapes. It’s no wonder that the tiny town of Springdale is consistently rated near the top of many “best of lists” as The Prettiest Town in America! 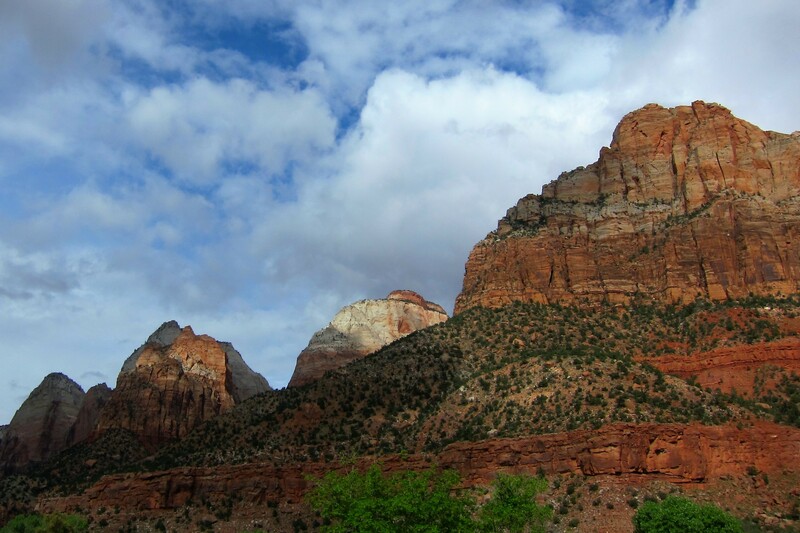 The incredible natural beauty only gets better as one travels up canyon, and a convenient way to do that is by way of the park’s propane powered shuttle buses. A round trip with ranger narrative takes about ninety minutes, a tour that Kit and I have enjoyed many times in the past. Back at our campsite we enjoyed a lite dinner, and later were asked over by our neighbors who had started a nice campfire and invited us to sit a spell and visit. 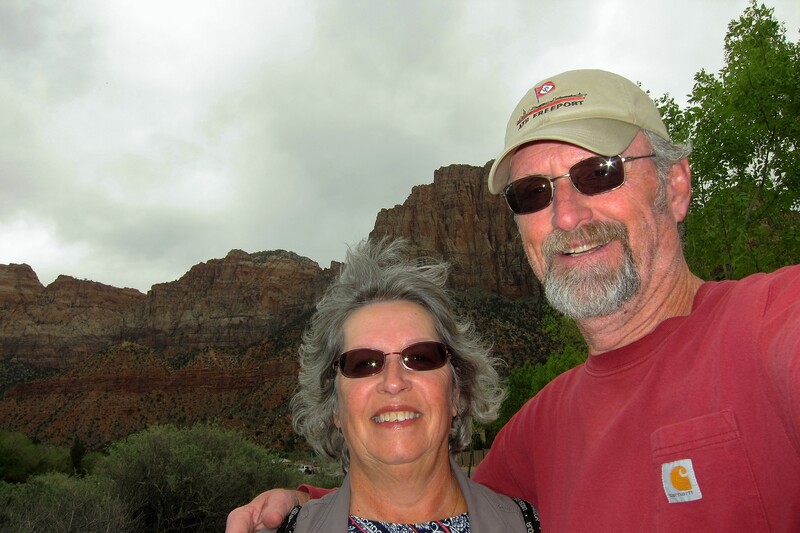 The Boyd’s are from Ontario, Canada and have recently retired to travel North America in their motorhome. It was nice meeting and visiting with them, and since they live just north of the border, we exchanged contact information in order to remain in touch. The following morning, Kit mentioned she wanted some quiet time to read and knit, which was the cue for me to go off exploring. 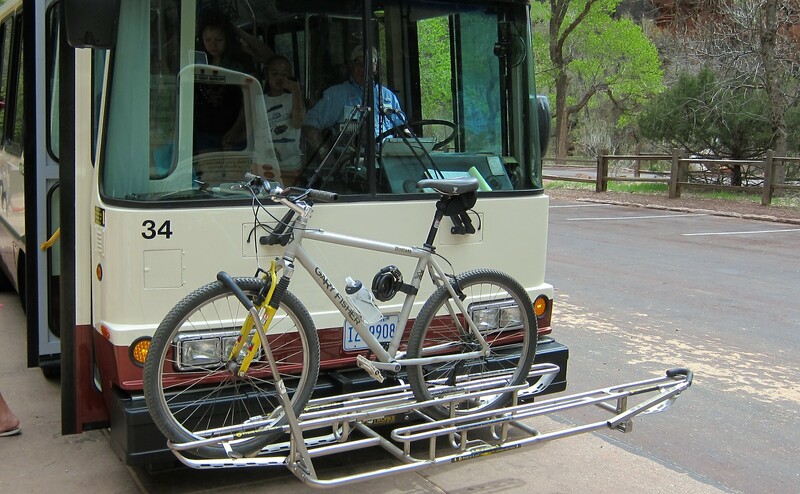 The parks shuttle bus has a rack on front for bicycles, so I loaded mine in the rack and headed up canyon in order to ride back at my leisure. The shuttle makes its final stop as the canyon walls close in at a place appropriately called The Narrows. 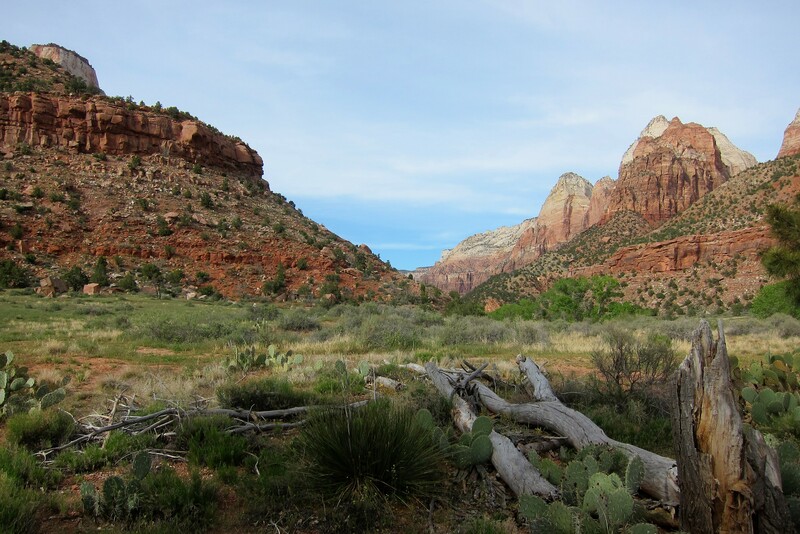 It is here that the more intrepid visitor can advance further up the canyon by hiking in the cold water of the Virgin River. 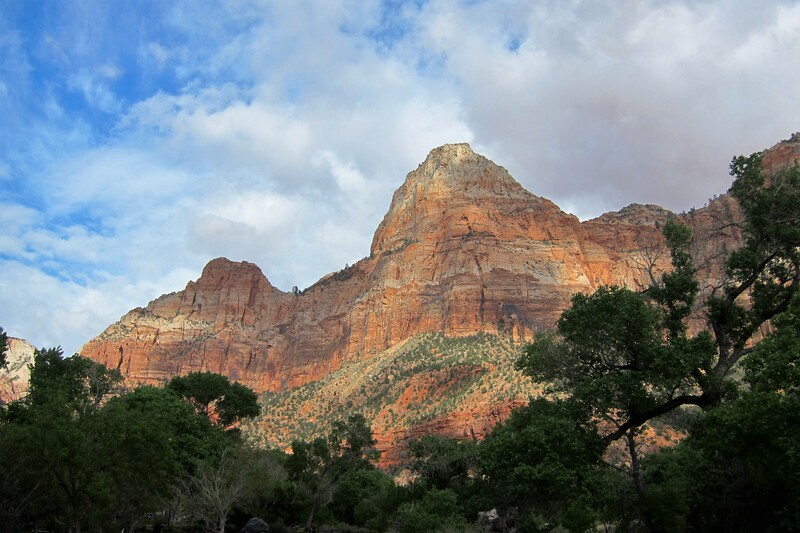 Unfortunately, at this time of the year, the trek up into the slot canyon is blocked by the park service due to the rapidly rushing water that cascades down from the northern snowcapped peaks. 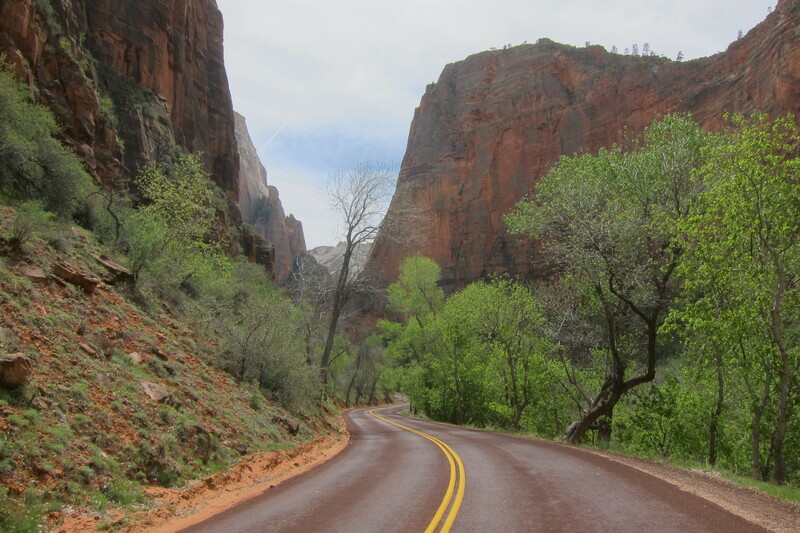 Zion National Park is the most inspirational park that I have visited…the more I spend in this unbelievably scenic place the more I believe that if God was going to preach on earth, he would select Zion National Park as his Cathedral…yes, it is that gorgeous! 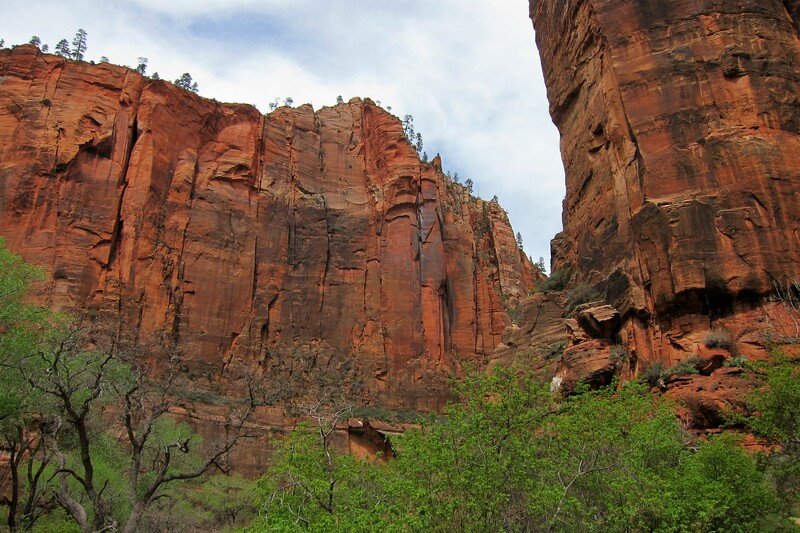 And, the best way to experience it is by hiking one of the many classic trails, which I’ve done in the past. 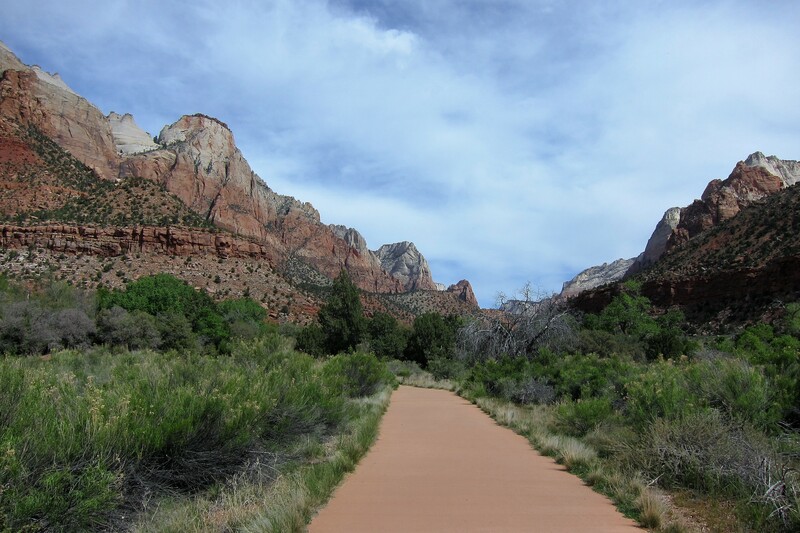 However, this year I was nursing a sore foot so stuck to riding my bike…another great way to truly experience the majesty. I hope the following photo gives you an idea of just what I’ve been gushing about. 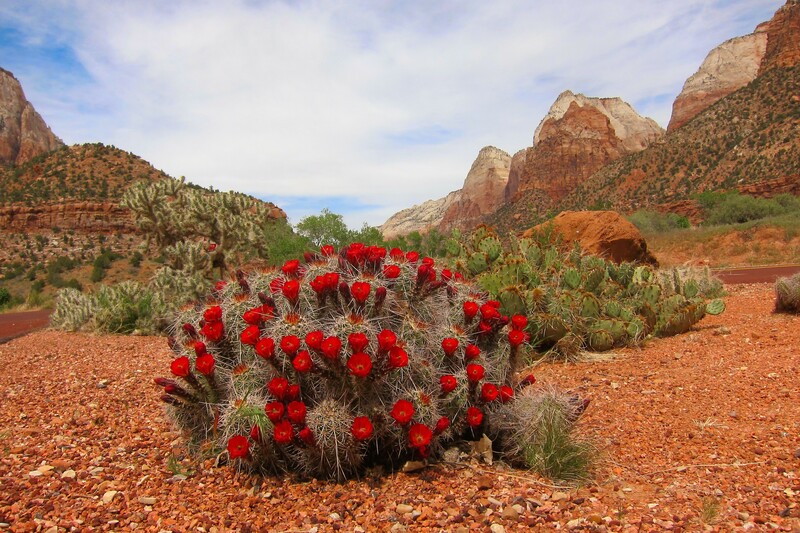 This photo is one of my favorites from this year’s trip…I really liked the flowering cactus framed by the soaring sandstone monoliths. In order to get the desired perspective, I had to lay on my side, a sight that drew more than a few curious stares from passersby. 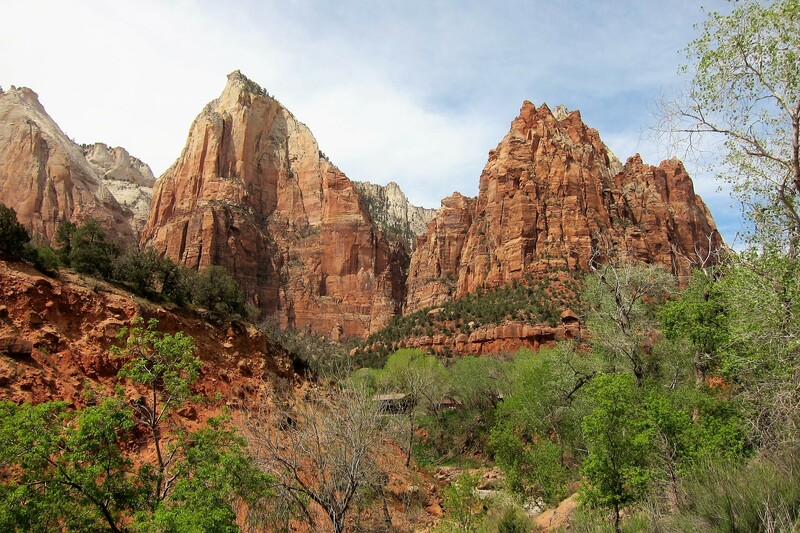 Since Kit and I have extensively explored and journaled Zion National Park during our previous Excellent Adventure trips, I have run out of superlatives to describe this incredible place. So rather than bore you with the same old details as to its origin and history, I’ve decided instead to let its scenic beauty tell the story. 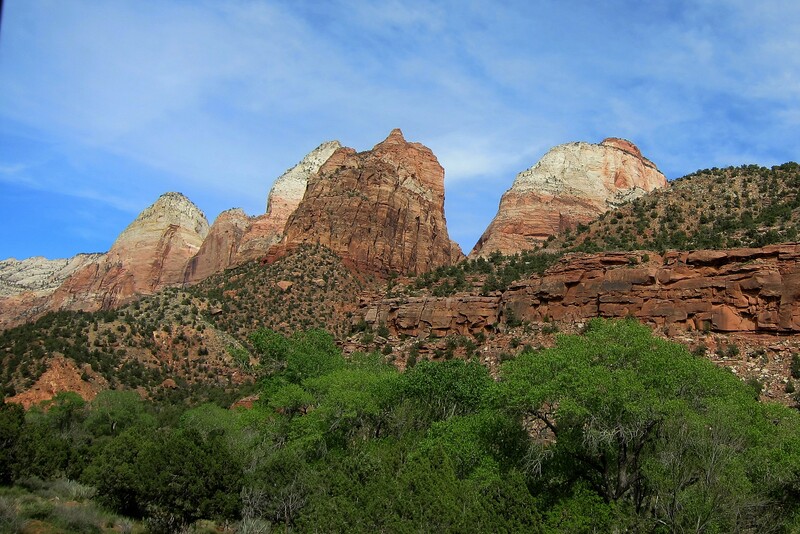 If it is true that one picture is worth a thousand words, then please enjoy the following 14,000-word essay on Zion National Park! Kit’s Bit’s: And here is my 1,000-word rebuttal! What can I say! I’m looking like my mom in this picture! Usually, I look like my dad. Hmmm??? This is an incredibly beautiful park; I always enjoy it. Your camera said a mouthful, Bill!! Beautiful!! 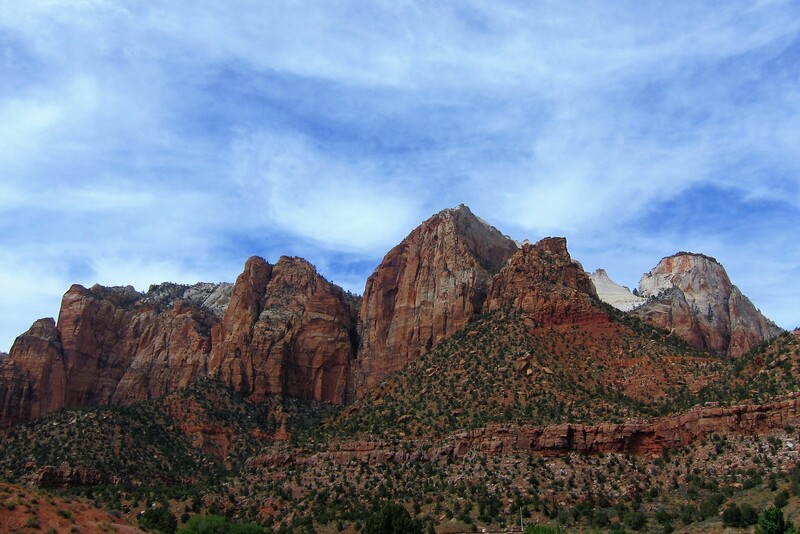 Three words come to mind with your incredibly STUNNING pics of Zion…WOW WOW WOW! 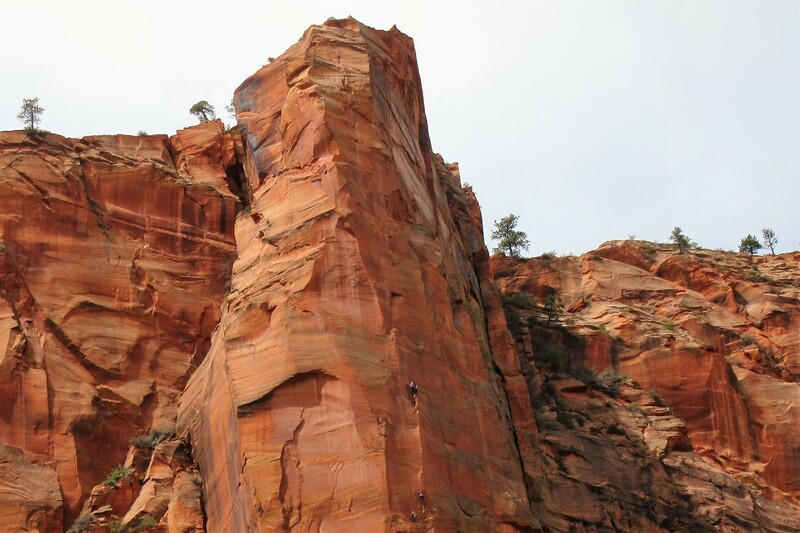 I had always wanted to go to Zion while I lived in Arizona but never did….. it is definitely on my bucket list now! 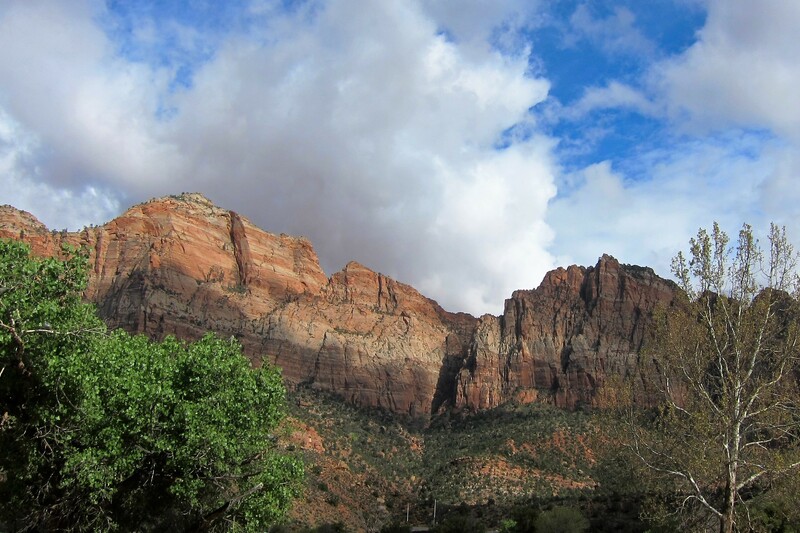 Zion looks like God threw a bit of of Sedona, the Painted Desert, and the Grand Canyon together and produced this incredible piece of heaven on earth!!! 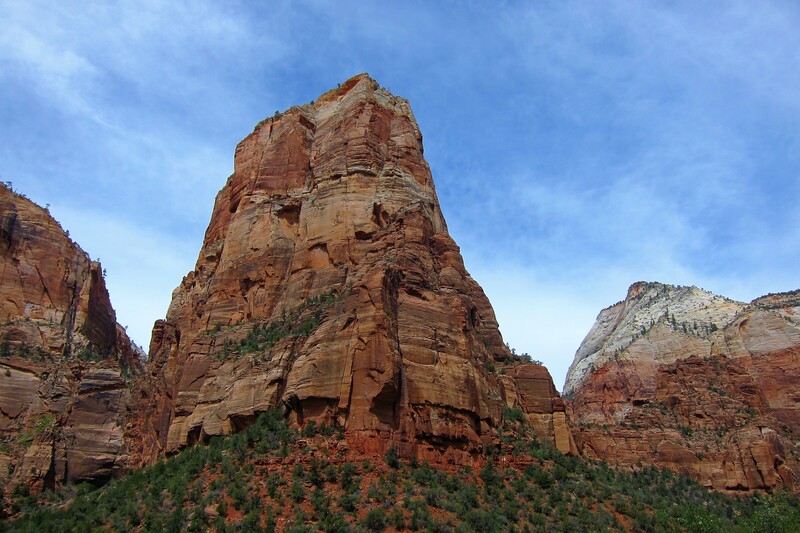 Truly God’s cathedral…..thank you so much! Great set of pictures Bill. Keep them coming.